During these End Times, many are waking up to the idea that our souls have been maliciously trapped in human bodies for repeated incarnations over thousands of Earth years. THE LIES WE ALL HAVE BEEN TAUGHT. Today the exterior material world would still have us believe that we are destroying our bodies by misuse and that ageing is the result, but in truth, we are not our human bodies, we are divine souls. When souls reach their higher potential, we will awaken to the purpose what our true values are. For some, it has been to unravel the mystery behind ageing. Pro-immortality “longevity” laboratories have been founded in several countries to provide support for research to find an anti-ageing and radical life extension solution as fast as possible. Many claims are made to make it possible to provide access to such technologies to the majority of people alive today. SCIENTISTS TELL US THAT THE FREE RADICALS AGE US. Scientists keep preaching that there are many types of radicals, but those of most concerns in biological systems are derived from oxygen. Free radicals are a group of atoms that have one or more unpaired electrons. Radicals can have positive, negative or neutral charge. There is also a large body of evidence indicating that oxygen radicals are involved in inter-cellular and infra-cellular signalling. Despite their beneficial activities, reactive oxygen species can clearly be toxic to cells. Millions of people spent a fortune on anti-ageing products. So it’s a huge money-making machine! We have been told that as a person ages, they have more free radicals floating through their body, causing cell damage, so the anti-ageing industry came up with the term antioxidant supplements. Some scientists recently found out that It appears that by taking extra antioxidant supplements this may, in fact, be speeding up the ageing process. Why? While free radicals fight against it, by boosting free more radicals due to the extra antioxidant supplements, these pills were actually increased the lifespan of free radicals! Antioxidants are an inherent part of a healthy diet, as in fruit and vegetables, and yes these foods all have links to a healthier life by providing essential vitamins and minerals, but by taking extra antioxidant supplements, this isn’t particularly effective in stopping the effects of ageing. IF DEATH IS NATURAL THEN WHY ARE SOME SPECIES ON EARTH IMMORTAL? Does the Girl who never ages hold key to ‘biological immortality? Why, for example WHY DO, creatures live many times the average human life? What is it that makes them better, more natural, more suited to or worthy of longer lives than us? Some animals living in our world seem to be kicking death just by hanging around and doing what they do. These species have managed to stick around the planet for mind-blowing amounts of time. Bdelloids: a type of microscopic organism that lives in fresh water, yet can survive out of water for years by Stealing DNA from Other Species. The jellyfish I mentioned in my article: Was Aging programmed into our DNA? Some animals, in particular in worms, have shown that mutating certain genes can increase one’s lifespan about 4-fold. For humans, that would translate to about 300 years old! Do these results support that there are genes that determine how long we live? In my visionary world, the world of Tulanda in my novel: Parallel Realities, we have centenarians walking around with people who have lived for 500 or 1,000 years. What would it be like if we could live for many hundreds of years and keep looking between 30 to 40 years of age? Ray Kurzweil claims that by 2045, an event known as “the singularity” will occur, and humans will become one with machines. That reminds me of the third movie in the Matrix series. Other futurists envision a world in which a computer serves as a backup for our brain and silicone parts will take the place of frail limbs. This reminds me of a Trans-humanism society. “I don’t want to achieve immortality through my work. I want to achieve it by not dying.” said American director Woody Allen. Aubrey de Grey also claims that ageing is merely a disease. Aubrey de Grey a computer scientist, self-taught bio-gerontologist and researcher, is a man of ideas, and he has set himself toward the goal of transforming the basis of what it means to be human. David Sinclair is a scientist and entrepreneur working on increasing human health, productivity, and lifespan. His research is aimed at understanding why we grow old and using this knowledge to prevent and treat both rare and common diseases. He is working on a ‘cure for aging’ and believes modern medicine can significantly extend the human lifespan. These are so many different viewpoints on the topic of aging, and I’m sure that the pharmaceutical companies would be aghast if there would be a pill available like David shows at the conclusion of his talk. Or if a pill will one day get onto the market it’s probably so costly (if pharmaceutical companies get hold of it) that its only available for the super rich. The meaning of Methuselah’s age has engendered considerable speculation. As the oldest man mentioned in the Bible his story fascinated me as a child. Methuselah was 969 years, older than Noah who was 950 and Adam who was 930, as well as several others whose ages approached 900. Were they perhaps living in the times when the Bosnia Pyramids were built? The Bosnian Valley of the Pyramids is located in the Visoko River Basin 30km N/W of Sarajevo. In my article: Was ‘aging’ ever mean to happen? I mentioned more about the discoveries of the Bosnian pyramids; that there were three different types of energies found. Dr Osmanagic says; when we once again have a clean and permanent energy source that we can use for anything we want, like communication, space travels, transport and it can even manipulate time and space, we would enter into the new world. Dr. Paolo Macchiarini of the Karolinska Institute in Stockholm, Sweden, is pushing the boundaries of the emerging field of regenerative medicine, which involves using a patient’s own cells to rebuild tissues and organs. Modest philanthropic funding for this research commenced in 2005 under the administration of the Methuselah Foundation of which I’ve been a member. The total funds raised grew to more than $7 million by 2009 – and kept going. 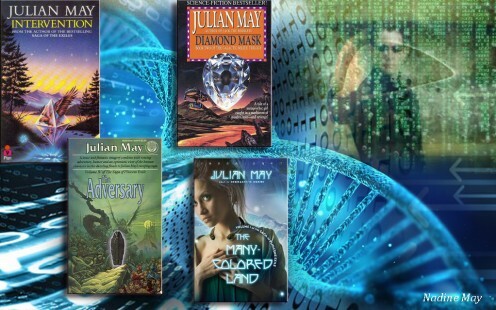 Julian May an American science fiction author with her Galactic Milieu Trilogy has inspired me no end. All her works are situated in the same ‘world’ – our earth from now till 22nd century and six million years before…The major differences are the development the mental powers, rejuvenation by choice and an alien milieu ready to deceive humanity into a mental unity and a one-way gateway to Pliocene Earth. Q: What about higher mind functions? Do you believe that they exist? During these End Times, it is possible now for us to reclaim our souls that have been captive here for a long time. Our souls are electromagnetic fields of energy that surrounds our human body and it is about a mile in diameter. Its size varies depending on the “age” of the soul, or how far it has progressed through its soul evolution. We have to re-inform our hearts and minds in order to obtain the necessary flow between the “info in and info out”. The soul cannot be fooled and will detect any lies in the system. It will offer healing of the lie though, and it is up to the individual to apply the medication to heal. The medication is usually in the form of truth. Thanks for reading my research post for my novels. ← The Truth will set us Free!